Alternatively, it's possible to get a connection to Dinan on the EuroStar, after first journeying into Paris. You can also fly into Dinard from Stansted Airport. Brest, Nantes and Rennes are Brittany's main regional airports. Brittany, or Bretagne as it is known to the French, has a distinctly different identity from the rest of France. Bretons have their own language, customs, cathedrals and festivals, the region only officially becoming part of France in the 1500s. One of the many stories explaining the creation of Brittany is that the region was founded by Cornish settlers fleeing England. Brittany benefits from a beautiful jagged coastline with cliffs, beautiful sandy beaches, seaside resorts and lively commercial and unspoilt fishing harbours. At the tip of Brittany, between the headland of Le Conquet and the famous Pointe du Raz, the military port of Brest stands guard over what is one of the busiest shipping routes in Europe. Further south lies the Gulf of Morbihan, an amazing inland sea dotted with islands. It is a real haven for seabirds and a sailing paradise. This is the heart of Brittany, a mysterious, spell-binding land of myths and legends. Here, health-giving wells, romantic chateaux and charming, picturesque towns of special interest are waiting to be discovered. Inland Brittany also has 600 kilometres of canals and rivers. The main economic activities in the region are agriculture and tourism. It is also a great region for seafood. Brittany is very popular with the British due to good accessibility and the variety of good value property. The large number of foreign buyers has helped revitalise some of the villages and towns that had begun to suffer from rural depopulation. Southern areas of Brittany have a distinctly better climate than the UK. The area around Vannes has as much sunshine (in terms of number of days per year) as Toulouse in the south of France. Ferries sail from the UK to St Malo and Roscoff regularly, although you may find cheaper services going to Cherbourg or Caen in Normandy so look around before you book. For many, however, flying is still the easiest option. Airports to use in Brittany are Dinard, Rennes and Brest. Due to the influx of foreign buyers in recent years, property prices have risen enormously in certain hotspots. However, most of the Finistère still offers exceptionally good value. Do you know Brittany better than we do? Do you have photos of Brittany? The Cotes d'Armor, meaning 'land of the sea', certainly lives up to its name. It comprises the majority of Brittany's highly attractive Northern coastline, including a number of islands. The historic towns of Dinan, Dinard and St Malo combined with great beaches, coastal walks and beautiful rivers make the Cotes d'Armor a particularly desirable department. Finistere has many parallels with Cornwall - a wild rocky coastline, an economy dependent on tourism and fishing, and gardens of tropical plants warmed by the gulf-stream. Despite the popularity of some of its southern coastal resorts, much of Finistere is very un-developed and property prices can be extremely reasonable. Not quite French, not quite Breton. Ille-et-Vilaine is still, however, the best point of entry into the Brittany region. Apart from fabulous St-Malo and the nearby beaches, it's the green valleys, deep forests and blue lakes that capture the imagination. Some say that Morbihan has an island for every day of the year. Arguments over what exactly constitutes an island, however, will leave many arguing long into the night. In the meantime you can attempt to figure out the secret behind the region's baffling standing stones. Their sheer number makes Stonehenge look like a small group of rocks. One thing is certain, however - the favourable climate and rolling landscape makes Morbihan a great place to visit. Most French market towns are attractive, but Antrain, in the Ille et Vilaine department of Brittany, is especially picturesque. Its riverside setting and old, stone built houses add up to a charming picture. And, the weekly market brings a real buzz to this traditional Breton village. Audierne is a charming fishing port town which is located on the mouth of the Goyen River, in the Finistère department of Brittany. Complete with sandy beaches, marina, fishing port and many shops and restaurants, the town embodies all that is loved about Brittany. The pretty little market town of Auray nestles in a bend of the River Loch in southern Brittany. Its ancient quarter with its delightful harbour has a timeless appeal and the town is popular with visitors in the summer. Baud is a lively market town which is found in the scenic surroundings of the Morbihan department of southern Brittany, in the north-west of France. Lying just 30 minutes from the beautiful Morbihan coast, Baud offers excellent facilities and easy access to many of the attractions of this lovely region. Bégard is a rural market town that lies in the north-west of France, in the Côtes d'Armor department of Brittany. It is well equipped with facilities such as shops and small restaurants and is an attractive place to settle or from which to explore more of the lovely Breton region. Belle Isle en Terre sits quietly beside the River Guer in the beautiful department of the Côtes d'Armor in Brittany, north-west France. With its population of around 1,000, Belle Isle en Terre is somewhere between a village and a small town, big enough to offer good shops and services, yet small enough to maintain a lovely tranquil air. The peaceful and pretty village of Berrien is found in the Finistère department of Brittany, in the north-western corner of France. Set in the heart of the Amorique National Park, the village is also within walking distance of the lively and popular town of Huelgoat, while being just over half an hour's drive from the coast. Binic, known as the beauty spot of the Côtes-d'Armor, is a delightful fishing port in northern Brittany. Set on the beautiful Breton coastline, Binic is a paradise for walkers and lovers of sea sports, as well as for those who simply love the Breton culture. If your idea of heaven is to bury yourself in the glorious tranquillity of the Finistère countryside, revelling in the unspoilt beauty of the landscape and the pretty, traditional Breton houses, then take a look at the tiny hamlet of Bolazec. Situated inland, the village is untroubled by tourism, save for guests at the local chambre d'hôtes who have generally also chosen Bolazec for its very tranquillity and are unlikely to spoil the peace! Bolazec is perfect for unwinding in the simple perfection of nature. Bourbriac is a peaceful, rural town that is located in northern Brittany, in the department of the Côtes d'Armor. Although Bourbriac lies inland, and does not attract the very high property prices that prevail on the coast, it is a very attractive town, popular with British buyers. The town is surrounded by lovely countryside, with dense woodlands, lush pastures and sparkling rivers. The little village of Bourseul lies in the Côtes-d'Armor department of Brittany, in the north-west of France. Although predominantly rural and peaceful, the village is within easy reach of the beaches at Dinard, the ferry port of St Malo and other big attractions of the region. Bréhan is a delightful small town that lies in the Morbihan department of Brittany, in north-west France. The town sits inland, amid picturesque countryside, yet is within 70 minutes of the sea. Bréhand is an attractive small town that is found in the Lamballe district of the Côtes-d'Armor in Brittany. The town comprises a vibrant community of all ages, and has shops, schools, services and leisure activities. Bréhand is surrounded by pretty, typically Breton landscapes. The Breton town of Brest lies in the west of the Finistère department in the beautiful Breton region of north-west France. Almost completely destroyed in the war (largely by British and American bombers trying to destroy a German submarine base in the port harbour), Brest sadly lost many of its historical buildings, but the indomitable Breton spirit has ensured that Brest retains a strong cultural identity. The town of Broons, despite its rather Scottish sounding name, is actually located in the Côtes d'Armor department of Brittany, in north-west France. Broons is a medium sized town which has excellent shops and amenities, making it an attractive place for property purchase. It lies in a lovely part of Brittany, surrounded by rolling countryside with picturesque rivers, lakes and forests. The town of Callac is found in north-western France, in the Côtes d'Armor department of Brittany. Perhaps partly due to having a high population of retired farmers, the town is deeply Breton in every way, to the point where you can even hear Breton being spoken in the streets on market days. The town of Carhaix Plouguer is located in north-western France, in the Finistère department of the Brittany region. Carhaix is an attractive town, with excellent shopping and dining facilities as well as all the useful amenities associated with the larger towns. It lies amidst the lovely Breton countryside, and is centrally located for exploring the rest of this wonderful region. The seaside resort of Carnac is located in the north-west of France in the Breton department of Morbihan. Filled with interest of both the ancient and the modern varieties, Carnac is a lively seaside resort as well as the site of an amazing 3,000 megaliths or standing stones, which draw crowds of visitors every year, eager to see if they can make sense of this age old mystery. Caulnes is a lovely little town that is found in the north-west of France, in the popular Côtes d'Armor department of Brittany. Set in the midst of beautiful, rolling countryside, yet with easy access to the coastal resorts and ferry ports, Caulnes is an idyllic location for either a new life in Brittany or blissful holidays in this wonderful region of northern France. The charming little village of Caurel is situated in the north-west of France, in the Côtes d'Armor department of the Brittany region. Set on the edge of the beautiful Guerlédan Lake, which offers many sports as well as restaurants and natural beauty, Caurel is ideally situated for both relaxation and activity. The market town of Châteaulin is a perfect place for those who wish to discover more of this idyllic part of north-west Brittany. Situated on the lovely River Aulne, in the department of Finistère, the town draws comparisons with Cornwall for its clean, pretty white and pastel coloured houses, grey slate rooftops and appealing ambience. Châteauneuf d'Ille et Vilaine is found, as the name suggests, in the Ille et Vilaine department of Brittany, in the north-west of France. It also, given its name, has a chateau! The village lies within easy reach of the region's favourite attractions and makes an ideal base for either holidays or full-time living. Châteauneuf du Faou lies in an idyllic location on a hill rising up from the Nantes-Brest Canal. The gloriously green countryside of Finistère, the most westerly department of Brittany in north-west France, provides a stunning backdrop to this picturesque and lively town. The little village of Cléden Poher is found in the Finistère department of Brittany, in north-west France. Located inland, in picturesque countryside, the village has good local amenities and is within easy reach of the beautiful Finistère coast. Cléguérec is a traditional village that lies in the Morbihan department of the region of Brittany, in north-west France. The village has a lively community life, small shops and local services, and a patrimony that offers some interesting sights. Access from Cléguérec to the beaches, historic towns and main tourist attractions of the region is excellent, so it makes a great base for getting to know Brittany. Collinée is a small but thriving village which is located in the north-west of France, in the beautiful Côtes d'Armor department of Brittany. The village, full of Breton charm, offers good local amenities and is within easy reach of all the region's major attractions. Collorec is a small and utterly peaceful village that is found in the lovely countryside of the Finistère department of Brittany in north-west France. Finistère is the part of Brittany which lies to the west of the region, and has some of the most spectacular coastline in the country. The lovely mediaeval town of Combourg lies in eastern Brittany, in north-west France. The town's chief claim to fame is that it was the home of the writer Chateaubriand, who famously said, "It is because of Combourg that I am who I am today". Commana is a small town lying in the wild and mysterious department of Finistère in the western tip of Brittany. The village is small and tranquil, notable mainly for its mysterious megalith or standing stone, and despite (or perhaps, because of) its lack of touristy attractions, it offers a charm that has tempted many to return or to seek to put down roots there. The town of Concarneau lies in north-west France in Brittany's most westerly department, Finistère. It has a fishing harbour and an old walled town which are two of the most photographed locations in France! The town, which is essentially composed of two separate areas, the old town and the new, is an important fishing port as well as a tourist haven. Coray is a fair sized village which is located in the unspoiled department of Finistère, in the Brittany region of north-west France. The village is well located for accessing the glorious beaches and cliffs of Finistère, as well as the many inland attractions such as leisure lakes, mystical megaliths and historic towns. Corlay is located in north-western France, in the region known as Brittany. Corlay is an interesting and lively town, well situated, and offering easy access to and from the UK. Corseul is a lovely Gallo Roman town which sits in the stunning surroundings of the popular Côtes-d'Armor department of Brittany, in north-west France. The town has some fascinating Roman remains to see and a good associated museum, and is also close to the mediaeval town of Dinan and other major sites and attractions. The town of Crozon lies on the Crozon Peninsula in north-west France. With its dramatic cliffs, beautiful coastline, delicious fresh seafood and abundance of outdoor pursuits available, Crozon is a paradise for those who love Brittany and all it has to offer. Dinan has been a visitor magnet for its preserved medieval character for many hundreds of years. The whole area is very popular with British buyers due not only to the beautiful town, but also the ferry ports in Brittany and Normandy which provide easy access from the UK. Dinard is a seaside resort where time stands still and the tides dictate a gentler pace of life. With all the usual Breton attractions, Dinard has changed little since it offered genteel holidays for Edwardian society. Today this resistance to change makes Dinard a perfect base for families. The charming mediaeval market town of Dol de Bretagne lies conveniently close to the ferry port of Saint Malo, making it an ideal getaway location for those who retain a home in Britain but want to enjoy the delights of Brittany as often as possible by owning a property there. Douarnenez is found at the western extremity of Brittany in north-west France. A picturesque town with plenty of atmospheric old cobbled streets to explore, Douarnenez also boasts some of the best beaches and sea views in Finistère. Once reliant on fishing for its economic life, Douarnenez nowadays has a thriving tourist trade, and is well equipped to support this with its natural advantages, as well as excellent shopping, dining and leisure facilities. Étables sur Mer lies in a fortunate position in north-west France, on the beautiful north coast of Brittany, otherwise known as the Emerald Coast. The resort is renowned for its excellent beaches and offers a warm and friendly welcome to all. Evran is a lively market town which occupies an enviable position on the River Rance, in the Côtes-d'Armor department of Brittany. Although not large, the town is well appointed, and offers all the facilities and amenities for a very comfortable lifestyle as well as the added attractions of a canal port. The nearby tourist attractions of Dinan, St Malo, Rennes and Combourg are all readily accessible from Evran. Fréhel is a pretty little village that sits in spectacular surroundings. It is found in the Côtes-d'Armor department of Brittany in north-west France, close to a stunning coastline and surrounded by lovely countryside. Glomel, which is situated in north-west France in the Côtes d'Armor department of Brittany, is a bustling and attractive village with all amenities. Although it lies inland, the coast is easily accessible from here, and the countryside around the village is of outstanding beauty. Gouarec is a village that lies in the north-west of France, in the popular Breton department of the Côtes d'Armor. Gouarec is an inland village in the south-west of the department, set in glorious countryside beside the Nantes-Brest Canal. Gourin is a small town that is found in the most southerly department of Brittany, Morbihan. Breton traditions are taken seriously here, and there are many Breton language speakers in the town. And as well as being typically Breton in style, Gourin offers all the facilities of a large town, yet is set in the lovely countryside of southern Brittany. Guégon is a picturesque village that is found on the banks of the River Oust, in the department of Morbihan in Brittany. Morbihan is known for its south-facing sheltered beaches and its charming old towns and villages. It is also characterised by a slightly warmer and sunnier climate than the rest of the region. Guémené sur Scorff is a very attractive town that is found in the department of Morbihan, in southern Brittany in France's beautiful north-western corner. The town has some lovely old buildings which are the focus of considerable tourist interest, and is also home to one of the oldest taverns in Brittany, which still serves customers today! Guémené sur Scorff is also fortunate in its natural surroundings, as it lies amidst lovely woodlands and is within easy reach of the Atlantic. The tiny village of Guenroc is set in the Côtes-d'Armor department of Brittany, in the north-west of France. With just around 200 inhabitants, Guenroc is barely a speck on the landscape, yet this little place has a great history and heritage. The village has a beautiful setting in some of the department's loveliest countryside, with woods, rivers, lakes and monuments. The town of Guer is located in the north-west of France, in the Breton department of Morbihan. Lying to the north-east of its department, it is close enough to Rennes airport to be an ideal getaway destination from the UK. Its charms don't end with a convenient location, however, as Guer is an absolute jewel of a mediaeval Breton town. Guerlesquin is a small town in the Finistère department of Brittany, in north-west France. Named as a "little city of character", Guerlesquin is set in beautiful, countryside, lying at the edge of the Monts d'Arrée National Park and just minutes from the beaches. And, the town is packed with interesting architecture and monuments to discover and offers activities for all the family. Guilliers is a small village in the Morbihan department in Brittany, in north-west France. Largely ignored by the guide books and tourists, it nevertheless is full of a quiet charm and is unmistakeably and quite delightfully French. Guilvinec is an important fishing port and good sized town which is located on the southern coast of the Finistère department of Brittany in north-west France. The town is well equipped with shops and famed for its seafood restaurants, the daily bustle of the port giving it a colourful and authentic view of Breton life. It is close to many good beaches and attractions, making it a great place for holidays. Guingamp is a lovely old town that is richly endowed with historical and interesting buildings. Set in beautiful Brittany, inland, yet only 15 minutes from the spectacular Breton coast, Guingamp is easily accessed from the UK, and therefore an ideal place to seek a second home in France. The picturesque village of Guiscriff lies in the department of Morbihan, in southern Brittany. It's typically Breton, packed with heritage and offers great local amenities too. 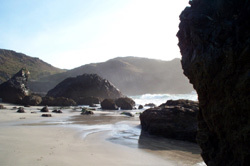 And being well located for access to the coast and the myriad other attractions of this ever popular region, Guiscriff makes a perfect holiday base. Guitté is a picturesque little Breton village that is found in the Côtes- d'Armor department, close to Brittany's best loved attractions of coast, countryside and mediaeval towns. The village is small but offers good local amenities, and is set in a delightful location amid beautiful countryside. The small town of Hénon is located in the north of Brittany, in the department of the Côtes d'Armor in north-west France. It lies in the soft rolling landscapes of inland Brittany, and is a perfect destination for those who want to recharge their batteries and enjoy the many mediaeval towns and beautiful beaches of north-west France. The quaintly named town of Huelgoat lies in the western extremity of France, the Breton department of Finistère. Although a popular tourist destination, Huelgoat remains unspoiled and is a pretty and traditional Breton town set in a stunning landscape of forests and intriguing rock formations. Josselin is a lovely Breton town which is dominated by a superb 11th century castle. Perched upon a granite rock, the Château Josselin sets the scene for a visit to what really is one of Brittany's most charming towns. Jugon, or Jugon-les-Lacs, as it is more commonly known, is a very pretty village in the north-east of Brittany, in northern France, close to the ferry port of St Malo. Jugon is ideally placed for easy access to and from the UK, and is recognised as a "petit cite de caractere de Bretagne", which translates to a "little village of character of Brittany". The beautiful and sought after department of the Côtes d'Armor, in north-west France, is home to the pretty little village of Kergrist Moëlou. Tucked away in the unspoilt countryside of inland Brittany, Kergrist Moëlou is a tranquil haven where you can kick back and relax in very authentic Breton surroundings. La Croix Helléan is a small and tranquil village that is found in the Morbihan department of Brittany in France's north-west. La Croix Helléan lies within the community of Josselin, on the Nantes Brest Canal. La Feuillée is a pretty little village that is found in the Finistère department of north-western France, in the ever popular region of Brittany. Typically Breton, La Feuillée has a great culture and a powerful sense of its Breton identity, perfect for those who want to discover the traditions of this fascinating part of France. The village of La Roche Bernard, which is situated in the south of Brittany in the department of Morbihan, is listed as a "little city of character". Whilst the "city" word is misleading, (the population numbers just 761), the word "character" is not. La Roche Bernard is quite delightful, packed with interesting features and offering a charming ambience. La Trinité sur Mer is a pretty little village and sailing port located on the south-western coast of Brittany, in the department of Morbihan. With only around 1,500 inhabitants, it is not a large place, yet manages to be notable for its proliferation of excellent seafood restaurants and annual water sports competitions. Lamballe is a lovely Breton town of some size, in the Cotes D'Armor department of the region. Handy for the ferry port of St Malo as well as the many delights of Brittany, the town is a popular spot for British property seekers. Landeleau is a pretty and historic village which lies in the Finistère department of Brittany, in the north-west of France. Landeleau is close enough to the lovely beaches of the Atlantic coast to invite long, summer days beside the ocean, while its inland location means that property can be purchased at very reasonable prices. The town of Landivisiau lies in Finistère, the most westerly department of the lovely region of Brittany in north-west France. A large and bustling town, Landivisiau provides all amenities with excellent shopping, dining and leisure facilities. The gorgeous village of Langonnet is found in the sought after Morbihan department in the region of Brittany, in the accessible north-west of France. With its rural location yet ease of access to towns and attractions, Langonnet is a delightful retreat to the peace of the Breton countryside, perfect for back to nature holidays, long weekends or even for full-time living. Traditional Breton properties are up for grabs here, so if you have been dreaming of a little stone longère amid these lovely surroundings, take a look a Langonnet. The village of Languenan is set in the Côtes-d'Armor department of Brittany. Languenan is just ten minutes away from beautiful sandy beaches and also the same distance from the mediaeval town of Dinan. It's a perfect spot to use as a holiday base, or to settle down to a new life in north-west France. Langueux is a seaside town that is located in the north-west of France, in the Côtes d'Armor department of Brittany. With a lively town centre and beautiful beaches, Langueux is a great holiday destination and is ideally situated for easy access from the UK. Laniscat is a small village that is located in rural northern Brittany in the department of the Côtes d'Armor. Utterly peaceful and unspoiled, Laniscat is a wonderful place to recharge your batteries and escape from the noise and thunder of the modern world. The town of Lannion is the second largest in the Breton department of the Côtes d'Armor, in the north of Brittany. Now a thriving and prosperous telecommunications centre, Lannion is also of interest historically, with mediaeval parts of town that are both fascinating and delightful. The village of Lanrelas sits in the lovely lush countryside of the Côtes-d'Armor department of Brittany, in north-west France. Being close to the attractive and lively town of Broons, means residents of Lanrelas have access to great shops and services. And, the location of Lanrelas, not far from mediaeval Dinan, presents the possibility of some great days out. Lanrivain is a traditional little village set in the tranquil surroundings of the Côtes d'Armor department of Brittany, in France's north-west. The peaceful setting, beside the Gorge de Toul Goulic, makes Lanrivain an idyllic rural retreat, yet also a good base for discovering many of the main attractions of the region. Lanvallay is found just a short walk away from the acclaimed mediaeval town of Dinan, in Brittany's Côtes-d'Armor department. Set on the River Rance, Lanvallay is the port area of Dinan, and its bustling, colourful life attracts visitors the whole year round. Lanvollon is a small town that lies in the north-west of France, in the Breton department of the Côtes d'Armor. The town is situated a short way inland, but is quite close to the capital of St Brieuc, and the glorious northern Breton coast is easily accessible. Le Faouet is a lively little market town that lies in the department of Morbihan in southern Brittany. Set in the lovely and sometimes mystical landscapes of the region, Le Faouet has all amenities and is well situated for further exploration of many popular Breton destinations and attractions. The pretty little village of Le Gouray sits in a lovely part of Brittany, in north-west France. It lies in the fresh green countryside of the Côtes-d'Armor department, with excellent access to the coast and all the major attractions of the region. Le Quiou is a quaint and picturesque village that lies in the very sought after location of the Côtes-d'Armor department in Brittany, in north-west France. History, heritage and culture go hand in hand with the name of this little village, and it also has the added bonus of being perfectly situated for accessing the best attractions of the area. Léhon, in the Côtes-d'Armor department, is quite possibly one of Brittany's most charming villages. Set close beside the acclaimed mediaeval town of Dinan, Léhon is named as a "little city of character" in its own right. The village has pretty stone cottages, a castle, an abbey and perhaps best of all, a delightful setting along the banks of the River Rance. Les Champs Géraux is a small village that is set in the beautiful surroundings of the Côtes-d'Armor, in Brittany in north-west France. The village has the twin advantages of being set on the lovely River Rance, and also of being a close neighbour of the stunning mediaeval city of Dinan, one of the region's top attractions. The little village of Locarn is found in a tranquil and unusual landscape of wild moorland and a rocky gorge, within the department of the Côtes d'Armor in Brittany, north-west France. With a population of just 527, Locarn is tiny but its location makes it an ideal base for exploring many of Brittany's most beautiful places. Locminé is a small market town which is found in the Morbihan department of southern Brittany, in the north-west of France. The town offers access to all the major attractions of the region, and lies within easy reach of the lovely Morbihan coast and islands. Locminé could be an ideal place for anyone looking to settle in Brittany and to establish a new life in this delightful part of France, as it is a vibrant little town with excellent amenities and a thriving population. The town of Lorient, situated in the north-west of France in the delightful region of Brittany, is a port town which once housed a huge German submarine base. Although many of the original buildings were destroyed in the bombing raids of World War Two, the town has a lovely fishing port and lies in a prime position on the Atlantic coast of Brittany. The pretty market town of Loudeac in north- west France combines mediaeval charm with a lively atmosphere and modern amenities. Set in the glorious Loudeac National Forest, the town makes a great base for tourists as well as in ideal spot for those wishing to settle in France. Loyat is a very pretty little village that is found in the Morbihan department of Brittany, in north-west France. The village has plenty of heritage and useful small shops and services. It's also perfectly located for further exploration of this lovely part of Brittany. The town of Mael Carhaix is located in north-western France, in the Côtes d'Armor department of the Brittany region. Set in the gently undulating countryside of central Brittany, the little town is not a tourist trap yet remains full of authentic charm and within easy reach of all the important towns and beautiful beaches of the region. The market town of Malestroit, in Brittany in north-west France, is a tranquil and unassuming little town that has just celebrated its thousand year anniversary. Quiet and unassuming though it may be, however, uninteresting it is certainly not. There are many unusual and fascinating features to Malestroit, and the town remains a jewel waiting to be discovered. The attractive market town of Matignon is situated in a lovely part of northern Brittany, near the coast of the popular Côtes d'Armor department. Matignon is small but lively, with all amenities and great access to the UK. The surrounding countryside is gentle and unspoiled, with traditional cottages, farmsteads and villages adorning the landscapes. The small but lively town of Mauron is found in the beautiful surroundings of the Brocéliande Forest in the Morbihan department of Brittany, in north-west France. With all amenities on hand in town, and within easy reach of many of the region's attractions, Mauron is ideally located for enjoying the best of Breton life. The tranquil little village of Mégrit lies in the beautiful, gentle countryside of the Côtes-d'Armor department in the region of Brittany, in the north-west corner of France. Mégrit is a typically Breton village, picturesque and rural, yet it is close enough to popular tourist attractions to keep all the family happy for holidays or days out. The pretty and tranquil village of Mellionnec is found in the lovely rolling countryside of the Côtes d'Armor department in north-west France, in the region of Brittany. Mellionnec is small and very rural in attitude, with a traditional Breton feel and a strong sense of community. It has declared itself as a "Cultural Village of Europe". Melrand is a typically Breton village lying in the sunny department of Morbihan, in southern Brittany. Picturesque and tranquil, yet with good local amenities, Melrand is a great location for holidays as it's close to plenty of attractions (including the seaside) and set in beautiful countryside. The desirable Morbihan department of southern Brittany is home to the pretty village of Ménéac. Situated not far from the mediaeval town of Josselin, Ménéac and its location in southern central Brittany makes a fantastic holiday destination for all the family. The market town of Merdrignac is located in a lovely setting in the countryside of the Côtes d'Armor department of Brittany. A good sized town with plenty of Breton character and charm, Merdrignac provides all amenities and services, and offers easy access to all travel links to the UK. The small village of Mohon is found in Morbihan, in southern Brittany. Mohon is a traditional village, tranquil yet with good basic amenities. And it's within easy reach of the mediaeval town of Josselin and many of Brittany's best attractions. Moncontour is a mediaeval fortified village that is located in the Breton region of north-western France, in the sought after department of the Côtes d'Armor. The village lies in a supremely beautiful and richly diverse natural environment, and is well situated for exploring the whole of north-west France. The lovely harbour town of Morlaix, in the Finistère department of Brittany, is the sort of place where you can wander for days without feeling as though you have seen enough. With its distinctive stone and timbered buildings overhanging the narrow cobbled streets of the old parts of town, Morlaix is full of history and character as well as charm. Mûr de Bretagne is situated in the north-west of France, in the Côte d'Armor department of the Brittany region. This village is beloved of those who know it well, yet not so widely well known that it is spoiled by too much tourism. There is much to commend it to visitors and residents alike, however, with charm, atmospheric night markets, a friendly welcome offered to all, and a fantastic location in one of the most beautiful and accessible parts of France. The town of Paimpol lies on the north coast of Brittany, and is famed for its oysters and for the beautiful pink granite cliffs which make the area so distinctive. Full of history and proud of its seafaring past, Paimpol has a full and varied cultural life and stages many interesting festivals and events throughout the year. With its pretty marina and excellent facilities, the town is as popular with holidaymakers as it is with full time residents. The lovely little village of Paule is found in the popular and delightful Côtes d'Armor department of north-west France, in the region of Brittany. The village is tiny, but offers facilities beyond its size, and exerts a powerful charm upon those who discover it, bringing them to return again and again. The town of Perros Guirec lies on the wild and wonderful Pink Granite Coast of Brittany, in northern France. It is a popular seaside resort, yet remains largely unspoiled, and has three superb sandy beaches that make it an ideal location for families. Its greatest claims to fame, however, are the amazing rock formations along its coastline, which have been eroded by centuries of lashing by the sea to form sculptures worthy of the finest artists! The pretty little town of Plancoët lies on the Arguenon River in northern Brittany, in the very heart of the department of the Côtes-d'Armor. Plancoët offers a charming blend of ancient and modern, having a strong sense of its history and culture as well as a good array of modern amenities. Plancoët's riverside charm and ease of access to the Emerald coast ensures also that the town is popular with holiday makers who boost the already buoyant economy. The lively little town of Plédéliac lies on the edge of a forest in the Côtes-d'Armor department of Brittany, in north-west France. The town's location makes it ideal as a holiday base, being close to all the area's major attractions and within easy reach of the coast. Pleine Fougères is a small and pleasant market town that is located in the pretty countryside of the Ille-et-Vilaine department of Brittany, in north-west France. Situated near the Normandy border, and not far from the great beaches of the northern coastline, Pleine Fougères is in an ideal location for easy access to the UK as well as for exploring both Brittany and Normandy. Plélan le Petit is a lively Breton village that lies just ten minutes away from the popular mediaeval town of Dinan, in a desirable part of the Côtes-d'Armor in the north-west of France. Ideally located for both ease of access from the UK and for accessing all the best attractions of Brittany, Plélan le Petit is a great base for a holiday, a weekend escape or a new life in France. The village of Plélauff is found in the delightful countryside of the Côtes d'Armor department of northern Brittany, in the north-west of France. Blessed by historic towns, beautiful coastline and easy access to the UK, the area is an excellent place to set down roots or to act as a base for holidays and blissful weekends away from the stresses and strains of UK life. Plémet is a charming small market town that is located in the Côtes-d'Armor department of Brittany, in north-west France. With excellent amenities, Plémet benefits from a delightful setting amid beautiful Breton countryside and a good location, within easy reach of the coast and all the attractions of the region. Plémy is a charming small town that is located in the centre of the Côtes d'Armor department of Brittany in the north-west of France. With beautiful and fascinating landscapes all around, the town is a perfect base for living or holidaying in Brittany, and is conveniently close to the ferry port of St Malo as well as to the airport at Dinard. Plénée Jugon is a small town that is found in the pretty Breton countryside of the Côtes d'Armor department in the north-west of France. Attractive and peaceful, yet having all amenities, Plénée Jugon lies close to Jugon les Lacs with its superb leisure lake, making it a perfect spot for sports and recreation as well as relaxation. Pléneuf Val André is a beautiful seaside town on the north Breton coast, in the department of Côtes d'Armor. There is something for everyone in this little town, with glorious beaches, a fishing port, great seafood restaurants and excellent sporting facilities. Plessala is a lovely market town which lies amid the picturesque green surroundings of inland Brittany, in the department of the Côtes-d'Armor. The town is close to the mediaeval city of Dinan, and within easy reach of the beaches and resorts of the coast. The town of Plestin les Grèves lies on the north coast of Brittany, and is a delightful town known for its lovely sandy bay. The town of Pleudihen sur Rance lies, as its name implies, on the beautiful River Rance that links the inland Côtes-d'Armor to the fabulous Breton coast and the port town of St Malo. This location makes it a wonderful spot for holiday home seekers, as it is easily and quickly accessed from the UK and is also close to the beaches, resorts and all the other wonderful attractions of northern Brittany. Pleurtuit is an attractive small town which is found close to the port of Saint Malo in the Ille-et-Vilaine department of Brittany, in north-west France. Not only does the town benefit from the ease of access by sea, but also from ease of access by air, as it is the site of the Dinard/Pleurtuit airport which brings Ryanair flights to the region direct from the UK. The pretty little town of Pleyben is set amidst the beautiful landscapes of the Finsistère department in the region of Brittany in north-west France. Pleyben is notable for its lovely Church of Saint Germain, of which guided tours are available in season. Pretty little Ploerdut is a rural village that's found in the Morbihan department of southern Brittany. With its traditional houses set around a picturesque church square, Ploerdut is a tranquil holiday base that's handy for many of Brittany's best attractions. The village is rich in history and heritage, and has useful local amenities. The town of Ploermel is located in the north-west of France in the Breton department of Morbihan. Lying to the north of its department it is truly placed on the crossroads of Brittany, and makes a great base from which to access the rest of the region. The attractive market town of Ploeuc sur Lié is found in rural Brittany, near all the mediaeval towns and fascinating historical sites that make this area such an interesting and desirable spot for holidays, weekend homes and even permanent living. Its many shops and restaurants give it a lively ambience, and the beautiful countryside that surrounds it makes the town a great choice for anyone seeking property in northern Brittany. The attractive market town of Plonévez du Faou is situated in the beautiful department of Finistère, in Brittany in north-west France. The town of Plouaret is found in the green countryside of the Côtes d'Armor department of Brittany, in north-west France. Plouaret is an historic market town, set inland yet just fifteen minutes from the nearest beach, and only half an hour from the glorious Pink Granite Coast. Plouay is an attractive town that lies in the Morbihan department of Brittany, in the north-west of France. The town has an impressive array of shops and restaurants, and its chief claim to fame is that it is known as the "Cycling capital of Brittany", hosting several important cycling events and being deeply popular with hobby cyclists and holidaymakers. The small market town of Ploubalay lies in glorious Breton countryside just a few minutes away from the beaches of the Côtes d'Armor in north-west France. Conveniently situated for ease of access from the ferry port of St Malo and the airport at Dinard, Ploubalay is perfect for finding all the best of Brittany right on your doorstep. The small and charming town of Plouer sur Rance is found in the Côtes-d'Armor department of Brittany, in north-west France. As the name implies, the town lies on the lovely River Rance, close to the beautiful Breton coast and the popular mediaeval town of Dinan. The town of Ploufragan lies in the north-west of France, in northern Brittany. The town has a thriving economy and a lively centre, yet remains attractive and unspoiled with plenty of history as well as a modern, forward looking community and a great quality of life. The little village of Plougras sits calmly amid the gorgeous Breton countryside, close to the coast of the Côtes d'Armor department of north-west France. Typically Breton, the village, whose inhabitants number less than 500, is a haven of tranquillity, yet it is close to many of the main attractions of this popular corner of France. Plouguenast is an attractive and lively village that enjoys all the benefits of being set in beautiful Brittany. Bordered by the glorious Forest of Loudeac, and close to heritage towns and tourist attractions, Plouguenast is a perfect place to put down holiday roots. Plouguernével is a small town that is located in the Côtes d'Armor department of Brittany, in the north-west of France. Pretty and peaceful and set in lovely rolling countryside close to beautiful lakes and canals, it nevertheless lies usefully close to the large town of Rostrenen. Although not situated directly on the coast, the lovely Breton beaches are, of course, easily accessible. The little market town of Plouha is found on the northern coast of Brittany, perched on top of some of the highest cliffs in the region. With its weekly market, sandy beaches and fresh air attitude, Plouha is a paradise for those who like their piece of France in its pure, unspoiled form... full of natural, unforced beauty and atmosphere. The village of Plounévez Quintin is found in the Côtes d'Armor department in northern Brittany, in north-west France. Lying far enough inland to benefit from the peace and tranquillity that is impossible to find in the popular seaside towns, it nevertheless has easy access to the beaches and resort towns for those times when you want a day out or a lively atmosphere. Plounévez Quintin is surrounded by lovely countryside, and has a traditional Breton feel. Plouray is a charming village which lies in central Brittany, in the beautiful department of Morbihan. The area is rich in both built and natural heritage, and the village lies close to many of the main attractions of the region. The village of Plumaudan is found in glorious, unspoilt countryside in the ever popular department of the Côtes-d'Armor, in the region of Brittany in north-west France. The village, which is of traditional style and not inconsiderable charm, is set close to the lovely River Rance and its mediaeval port town of Dinan, one of Brittany's premier attractions. The small town of Plussulien of is located in north-western France, in the region known as Brittany. It lies in the lovely countryside of the popular Côtes d'Armor department in the north of the region, and as such is handy for ferry ports and for general access from the UK. Pont Croix is a picturesque village that lies on a promontory in Finistère, in the region of Brittany. Its winding streets and stone houses give an air of old fashioned charm. And its setting near to the wild and beautiful shores of Finistère makes it one of the department's most desirable locations. Pontivy is a typically attractive and interesting Breton town in north-west France. The town is quite large, and is well equipped with shops and architecturally interesting buildings. Being situated in central Brittany, Pontivy makes an ideal base for exploring this beautiful part of France. The beautiful small town of Pontrieux, in the Côtes-d'Armor department of Brittany in north-west France, draws comparisons with Venice and Amsterdam, thanks to its network of waterways, bridges and colourful way of life. Its Breton character and heritage shine through, with many festivals held in the summer months, and its location offers ease of access to most of the region's main attractions. The town of Pordic lies in the north of the Brittany region of France, in the department known as the armoured coast, or the Côtes-d'Armor. Brittany is known for its beautiful beaches and coastline, and Pordic lives up to the ideal, with perfect stretches of sand, backed by dramatic cliffs and topped with an endless Breton sky. Poullaouen is a peaceful village that is located in the wild and beautiful Finistère department of north-west Brittany. The village is quiet and unspoiled yet with a thriving community and a strong economy. Although it was once a copper and silver mining centre, Poullaouen today is a very attractive town with a high standard of living. The town of Questembert, in southern Brittany, is a lively and attractive market town. The weekly market, which is as colourful and delightful as any in France, sells a range of local products in the town's unique sixteenth century market halls. Questembert is in the south of the department, so it is exceptionally well placed to provide access to the lovely Breton coast. The town of Quévert is found in the Côtes-d'Armor department of Brittany in north-west France. Close to the mediaeval town of Dinan, the coast and many other attractions of the region, Quévert has a range of shops and services and makes a great base for enjoying the best of Brittany. Quiberon is unique. The seaside resort, located in the Morbihan department of Brittany, lies not quite on an island but neither quite on the mainland, being situated at the toe of a slim peninsula that juts out into the Atlantic Ocean in southern Brittany. The Quiberon of today is a popular tourist resort, but originally sardine fishing was the lifeblood of this town. The lovely town of Quimper, capital city of the department of Finistère in north-western France, lies close to a spectacularly beautiful part of France's Atlantic coastline. Mediaeval and tranquil in parts, yet modern and lively in others, Quimper attracts tourists to see its ancient streets and buildings, to sample its superb Breton cuisine and to buy its famous Quimper faience pottery. The pretty mediaeval town of Quimperlé is found in southern Brittany. Typical of its region and era, the town's old quarter radiates charm, with narrow streets and ancient colombage houses. And with the added bonus of its proximity to the coast this makes it a great draw for the tourists in summer. Quintin is a very attractive small town that is found just a few minutes inland from St Brieuc, in the lovely Côtes d'Armor department of Brittany, in north-west France. The town has several attractions, among them a chateau, a lake and many listed buildings, and is full of original Breton character. It was once an important centre for the weaving industry, and preserves this heritage with a museum and a festival. Redon is situated at the joining point of 2 rivers, a canal and 3 departments. It is a small town with a traditional market and is within easy reach of both Vannes and Nantes. House prices are more reasonable in Redon than they are in the popular coastal resorts. Rennes is a mixture of both old and new. With well maintained and preserved architecture and modern shopping areas. Rochefort en Terre is a small village in Morbihan, Brittany, with just over 700 inhabitants. Small it may be, but it's got an impressive collection of titles, being designated as one of France's most beautiful villages, a little city of character and a village in bloom. Rohan is a lively village that lies in the lovely and mythical department of Morbihan, in the south of the Brittany region of north-west France. Bisected by the picturesque Nantes-Brest Canal, Rohan is authentic and charming, and offers a collection of useful and enjoyable shops, cafés and restaurants. Roscoff, set in the Brittany region of north-west France, is possibly the least well known of the northern port towns. Served by Brittany Ferries, Roscoff is considerably quieter than the larger, busier ports, and retains a traditional ambience that makes it a delightful place in its own right. The town of Rostrenen in central Brittany in north-west France, is an unspoiled gem of a town. It is well equipped with restaurants, supermarkets and leisure facilities, but the architecture is pure Breton stone and slate, and the lack of modern development means that it is a place that retains its original charm. The old village of Ruffiac is found in the Morbihan department of Brittany, in the north-west of France. Ruffiac is tranquil and picturesque, yet offers amenities and also good access to many of Brittany's best attractions. The village of Saint Aignan lies amid glorious countryside in the Morbihan department of Brittany, in north-west France. Bisected by both the Nantes Brest Canal and the River Blavet, and with the fabulous Lake Guerlédan and the Forest of Quénécan on the doorstep, this village is full of Breton character and offers an authentic and rich natural splendour as well as architectural heritage. The old market town of St-Brieuc is the capital city of the Côtes-d'Armor department of Brittany, in north-west France. Lying in an idyllic location on the beautiful Breton coast near the ferry port of St-Malo, St-Brieuc is a busy administrative and industrial centre, yet with some attractive and traditional parts to it too. The village of Saint Carreuc is located in the north of Brittany, in the department of the Côtes d'Armor in north-west France. Surrounded by beautiful forestry and pastures which have formed the traditional basis of the economy, Saint Carreuc is well placed for access to the UK, with ferry ports and airports easily accessible. 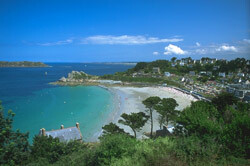 The town of St Cast le Guildo lies on the lovely Emerald Coast of Brittany, in the north-west of France. St Cast le Guildo is a port town, with a deep water harbour, seven lovely sandy beaches and excellent facilities that make it extremely popular with holiday makers and residents alike. Saint Gouéno is a lovely village that lies in the Côtes-d'Armor region of Brittany, in north-west France. Famed for its motor racing track and hill climb, the village is nevertheless a peaceful and traditional corner of Brittany, set against a backdrop of unspoiled countryside. Saint Hernin is a peaceful little hamlet that sits in an unspoilt landscape in inland Finistère, the most westerly department of Brittany in north-west France. Tiny and untroubled by the stresses of modern living, Saint Hernin is nevertheless close enough to all of the region's many attractions, and less than an hour's drive from the beautiful beaches for which Brittany is famed. The town of St-Malo, in north-western France, is so much more than just a ferry port. Beautifully preserved, the city has much to offer both in terms of historic attractions and scenic beauty, as well as the more modern pastimes of shopping, dining and sporting activities. Saint Mayeux is a charmingly authentic Breton village that is found in the department of the Côtes d'Armor in central Brittany. Ideal for exploring the lesser known inland towns, character villages and peaceful countryside, Saint Mayeux is still only 40 minutes from the coast with its lively seaside resorts, and just over an hour and half from the ferry ports. The town of Saint Nicolas du Pélem is found in the pretty countryside of the Côtes d'Armor department of Brittany, in north-west France. A charming, tranquil and traditional place, Saint Nicholas occupies that comfortable slot somewhere between being a town and a village... with the handy facilities of a small town, yet the unspoiled and peaceful air of an old Breton village. Saint Pierre de Plesguen is an attractive little town that is set in the Ille et Vilaine department of Brittany. The surrounding countryside is green and peaceful, yet Saint Pierre is just a short drive away from the capital Rennes, the coast and other top attractions. The town of St Quay Portrieux is a beautiful port town on the Breton coast, in the department of Côtes-d'Armor. Packed to the brim with colour and character, it is an ideal spot to take in all the glories of Brittany, whilst remaining within easy travelling distance of the UK. Sainte Tréphine is a small and deliciously peaceful village which is found in central Brittany, in the department of the Côtes d'Armor. Named for the murdered saint who was, according to legend, the wife of Bluebeard, Sainte Tréphine provides a charming retreat from the stress of modern life while offering ease of access to many of Brittany's loveliest and most interesting towns and attractions. The pretty and peaceful village of Saint Vran is found within the department of the Côtes-d'Armor, in Brittany. Rural and unspoilt, yet offering useful basic amenities, Saint Vran makes an idyllic base for holidays in this popular region. Scaer is a lively small market town that is located in Finistère, in western Brittany in the north-west of France. Designated as a "Station Verte" (a protected natural environment), Scaer is indeed as green and verdant as you could wish, and perfect for those who love the glorious Breton countryside. The village of Scrignac is found in the beautiful and unspoiled department of Finistère, which occupies the western tip of Brittany in north-west France. Scrignac is set inland, in very pretty countryside, near the rock formations of Huelgoat. Spézet is a small but lively town that is located in the beautiful and unspoiled department of Finistère in the north-west of Brittany. With its great location (inland but with easy access to the fabulous Finistère coast), its colourful houses and a strong sense of Breton identity, Spézet will charm all who discover it. The small market town of Tinténiac, in the Ille et Vilaine department of Brittany in north-west France, is bisected by the Ille et Rance Canal, and has an attractive quay for mooring of holiday boats. The town has a cheerful, Breton ambience, aided by its pretty market and array of shops and restaurants. It is close to the ferry port of St Malo and within easy reach of Dinan, Rennes and other major attractions. The town of Trébeurden is a lovely old fishing village that has transformed itself into a popular holiday spot in recent years, but which has lost none of its authentic Breton charm in the process. Trébeurden lies in the north of the Brittany region of France, in the department of the Côtes-d'Armor. The scenic marina is a popular spot for those exploring the region by boat. The little village of Trébrivan lies in lovely, lush Breton countryside in the department of the Côtes-d'Armor in north-west France. It's near to the bustling market town of Carhaix Plouguer, which is handy for shopping and restaurants, and within easy reach of the seaside and all the rest of the region's main attractions. The little town of Tréguier is found on a hilltop, overlooking a bay formed by the meeting of two rivers, the Guindy and the Jaudy, as they flow to the sea just a few miles ahead. Tréguier is classified as a "Petit Cité de Caractère", or a small town of great character, and as soon as you enter the town you can see how it has earned this classification. Situated near the coast in the south of the Breton department of Finistère, the little town of Trégunc offers a great opportunity to experience traditional Breton life, with its weekly market, lively atmosphere and charm. Trégunc is close to all the beaches and fishing ports of the Finistère coast, and has good shops, services and restaurants. The little village of Uzel is located in the Côtes d'Armor department of the Brittany region of north-west France. Small and tranquil, Uzel is nevertheless very charming and is conveniently situated for access to many of the delights of the region, and within easy reach of the beautiful beaches that stretch along the department's coast. Vannes is one of Brittany's most charming towns and also contains the region's most important historical sites. It is a lively town with great links to the nearby islands. The attractive old village of Yvignac la Tour lies in the soft green countryside of the Côtes-d'Armor department of Brittany in north-west France. With its distinctive tower, from which it gets its name, the village has an interesting heritage and is also conveniently close to Dinan and other major attractions of the region. In the north-western corner of France. WHICH DEPARTMENTS ARE IN Brittany?